If you want to add a little tranquility and peace to the backyard where you can sit and just relax and let stress go from the day, why not think about having an ornamental pond put in? Adding a small flower bed to this pond can provide even more beauty in the yard for you. Not only that, but you can just let us know what you’d like to see and we can make that happen for you – even less stress to worry about. There are many flowers that you can choose from that will fit the beds such as dwarf lilies, irises, annuals, astilbe and so many others. You can also choose water plants to put throughout as well – although these require a bit more work on the landscaper’s part. The plants are able to get the water right from the pond which is always a good thing, since it means minimal maintenance on your part. There are ways that landscapers make the beds for the plants so that they are able to thrive. Your landscape designer can create small areas for the roots to go and become nourished while in the water, while also being able to add the soil to them as well. If you don’t already have a water feature like this, your MN landscape contractor can create the beds at the same time they install the ornamental pond for you. They will make sure each of the plants is secured in their own areas so that you do not have to worry about them tipping over or becoming ruined. 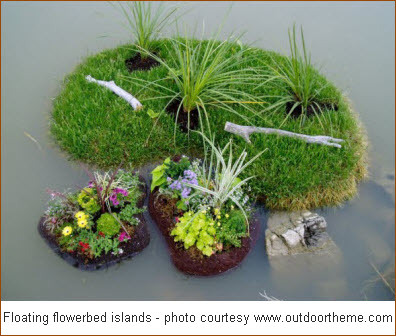 You have so many options to choose from when it comes to the type of flower bed you would like in the pond such as a stationary one or a floating one. Some designs include floating flower bed islands that freely drift around the pond; others are anchored in various ways. Each one is beautiful in their own way, but they require different plants and different amounts of work. These ponds can be a beautiful place to watch the flowers bloom and wildlife such as frogs, newts and birds come and enjoy. You can also add fish for even more interest. Water features add so much to a landscape design, and when you incorporate a flower bed, you’ve got even more visual appeal. Speak with us here at Architectural Landscape Design to find out more regarding what we are able to provide you with when it comes to the ornamental ponds that we can design and install for you. Contact us today for a free consultation. Now is a great time to start planning your pond installation. We’ll come out and assess your yard, talk over your desires, and come up with a design that fits your needs and wants for a beautiful backyard water feature. To schedule an appointment, call us at (952) 292-7717.